Morning! I have found that a hearty fiber filled breakfast is the key to maintaining weight. It keeps you from grazing throughout the morning or picking out a poor snack form the office vending machine. 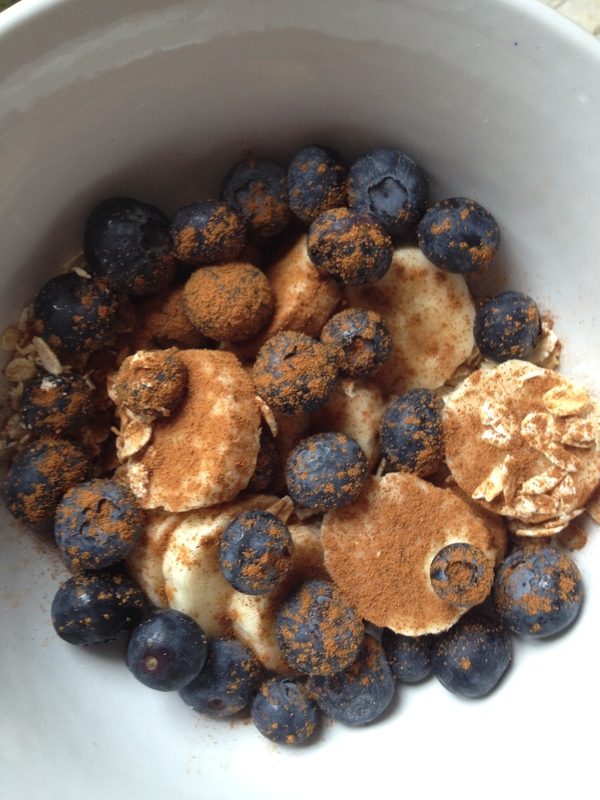 One of my morning “go to’s” is Crunchy Cinnamon Fruit Oatmeal. This easy to make breakfast is filling and holds off hunger pangs all morning! (Win!) There are endless fruit combinations that help keep this oldie but a goody interesting. 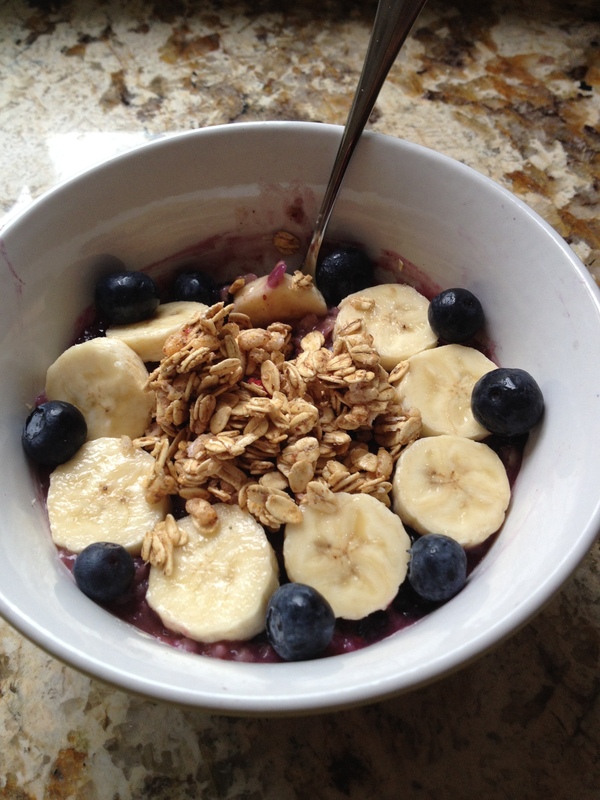 Today’s concoction included blueberries and sliced bananas. 2.) Dust generously with cinnamon. 3.) Drizzle the agave nectar on top. 4.) Add the water and stir. Cook in the microwave for approximately 1:30 to 2 minutes. The cook time may differ depending on your microwave. Watch the microwave to avoid overflow and exploding fruit. (I have learned this the hard way). 5.) After carefully removing the bowl from the microwave, top the oatmeal with the remaining fruit and granola. I am all about texture when it comes to food. You can also add some skim milk to adjust the texture of the oatmeal. Personally, if oatmeal is too thick and paste like I have trouble getting it down. I love adding granola to my oatmeal for some textural contrast. That is also the reason behind only putting half of the fruit in prior to cooking. Its the difference between fresh delicious oatmeal and mushy wall paper paste. For around 250 calories you get about 6 grams of protein and 4 grams of fiber. That is some staying power right there! Its delicious and keeps you full and energized throughout the morning. What more could you ask for from your breakfast?! 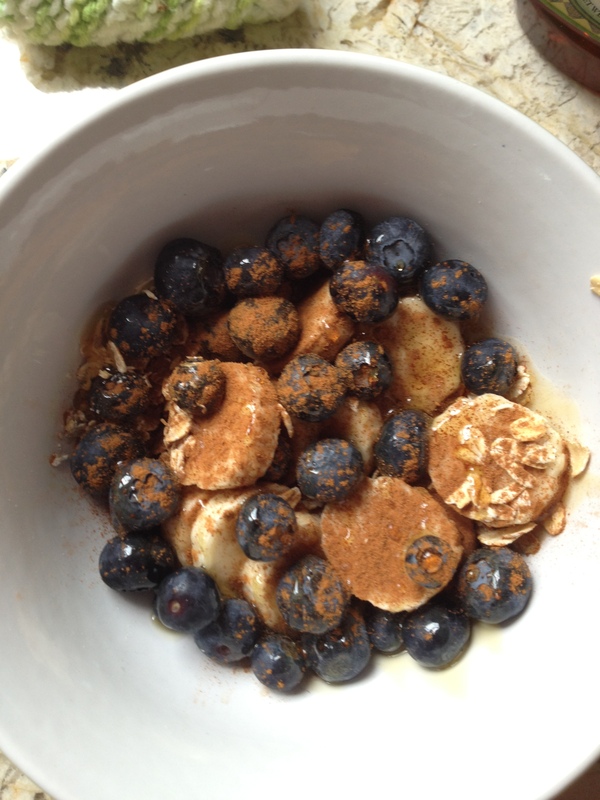 This entry was posted in Breakfast, Snacks and tagged Breakfast, Cinnamon, Crunchy, Fruit, Granola, Oatmeal on July 9, 2012 by Sizzle Food.